Throughout 2018, we are engaging in an International Call for Ideas, Exhibition, Gala, and Publication, collectively offering a platform for individuals and teams to share their future of “The Crescent City” with professionals, politicians, and the public. The International Call for Ideas has been crafted to allow submissions of all types (visual, text, audio, video, etc.) free of charge. Submissions will be considered for recognition in the online Exhibition and reviewed by a high-profile, multidisciplinary jury. Selected participants may be chosen to be flown to New Orleans, if not local, to present their ideas at the opening of the Exhibition and Gala, and prominently featured in the Publication. All submissions will be published either digitally or physically. In 2019, a curated online Exhibition will open, showcasing visions and ideas with presentations by participants and members of the jury. The opening will coincide with a Beaux Arts Ball themed Gala. futureNOLA, in all of its parts, will be documented in the form of a digital and printed Publication that will include all submissions to the Call for Ideas, images of the Exhibition and Gala, summaries, and conclusions. This will be shared with knowledge leaders in and around New Orleans with the goal of inspiring future visions to be planned for and implemented. Slideshow: Mississippi River Vista. Crescent Park, New Orleans, 2013. Photograph by Scott Heath. Used with permission. 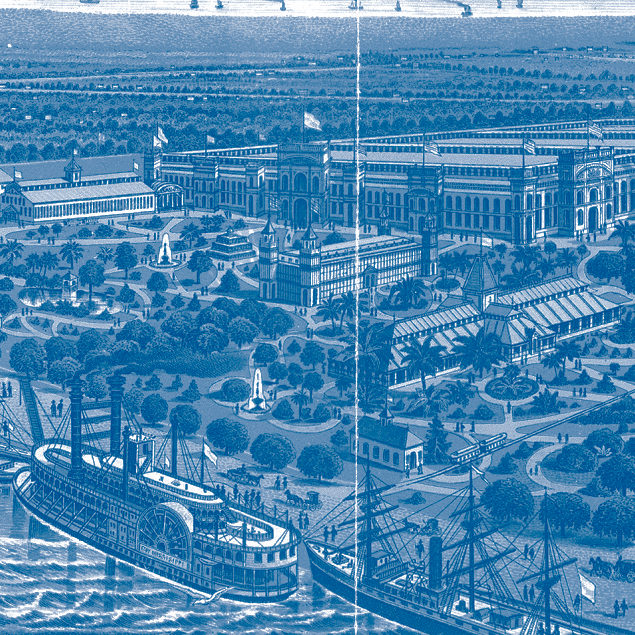 Bird's eye view of the "World Cotton Centennial" from over the Mississippi River front. Woodcut, c.1884. Artist unknown. Public domain. The Algiers/Canal Street Ferry across the Mississippi River, New Orleans. Ferry "Thomas Jefferson" seen approaching the Algiers side. New Orleans, January 2, 2007. Photograph by Infrogmation. Creative Commons. 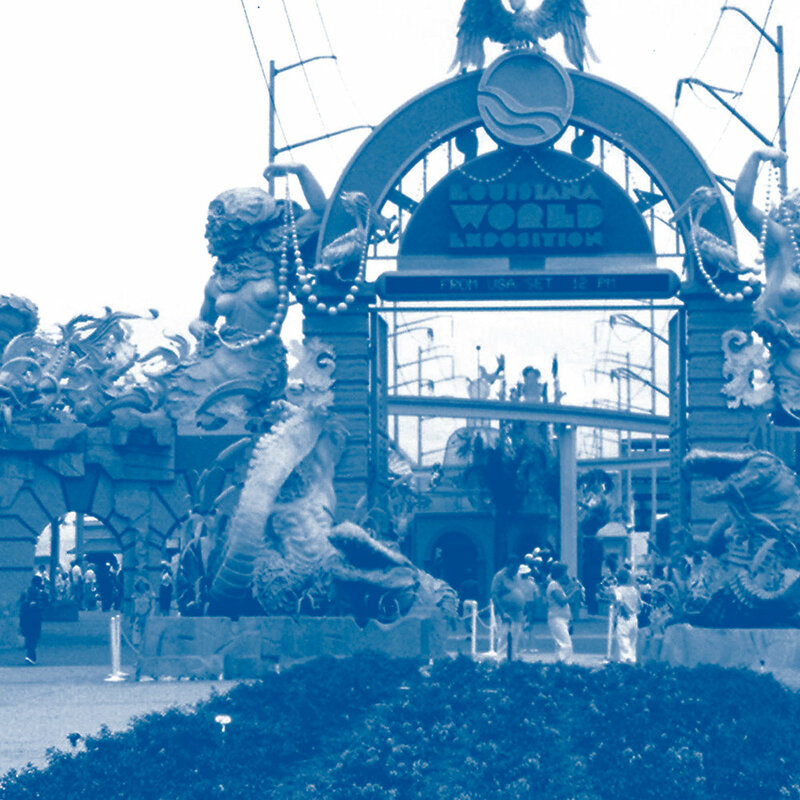 Main entrance to the 1984 World's Fair, New Orleans. New Orleans, 1984. Photograph by Carey Akin. Creative Commons License. Background images: New Orleans Skyline. Photography courtesy of New Orleans Architecture Foundation. Detail of map of New Orleans. Map by Scott Heath and others, 2012. Squares generated from GIS-based data from City of New Orleans. Bodies of water traced from Google Earth by Tulane City Center. In the midst of its Tricentennial in 2018, New Orleans faces incredible opportunities and even more significant challenges. Many will celebrate the unique history of the city by looking back. New Orleans Architecture Foundation in partnership with AIA New Orleans believes the legacy and cultural heritage of New Orleans is best honored by proactively asking visionaries across all media: how would you envision New Orleans over the next 300 years? This project is a call to action and an opportunity to responsibly frame the conversation about the next 300 years. What is your vision for a futureNOLA?